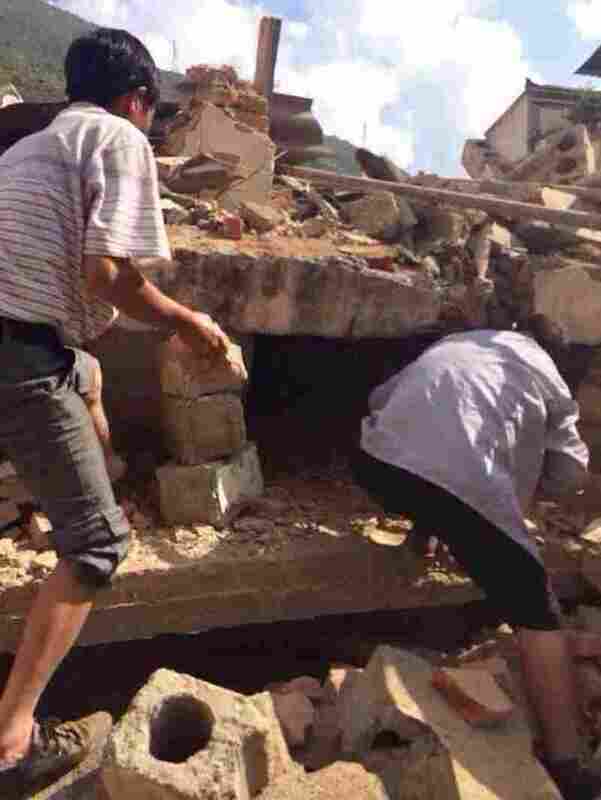 'It's So Terrible': Quake Reportedly Kills Hundreds In Southwest China : The Two-Way A 6.1-magnitude earthquake hit Yunnan Province Sunday afternoon, leveling buildings and rippling roads. Rescue crews are still working to find survivors. 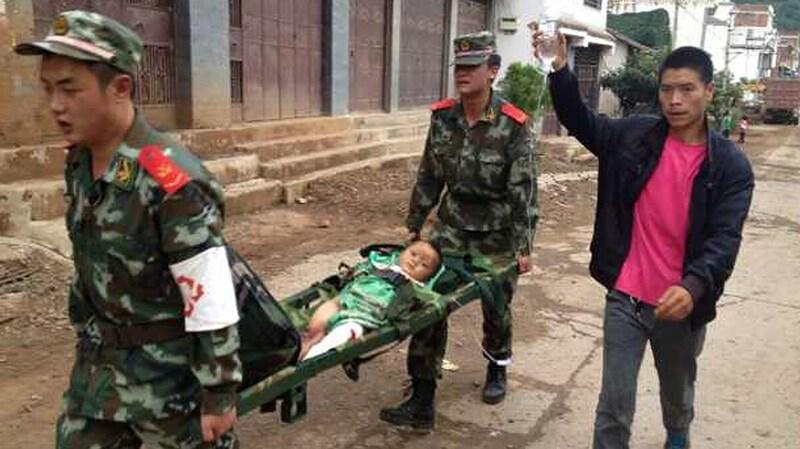 Rescuers carry an injured child on a stretcher after a 6.1 magnitude earthquake hit the area in southwest China's Yunnan province. The quake reportedly collapsed thousands of buildings when it struck Sunday afternoon. A 6.1-magnitude earthquake hit Yunnan Province Sunday afternoon, leveling buildings and rippling roads near the city of Zhaotong. News media in China are saying at least 367 people died in the quake, which struck in an area with old and vulnerable buildings. The death toll in this catastrophe has been sharply rising Sunday, after initial reports that around 26 people had died. We'll update this post as needed. More than four hours after the quake hit around 4:30 p.m. local time, state-owned media in China reported more than 180 people were still missing. The earthquake cut power and communication lines, and "more than 12,000 houses had been toppled and 30,000 damaged," reports the Xinhua news agency. Rescue crews are still working to find survivors who might have been trapped beneath the rubble — an effort that's complicated by recent mudslides that have made some roads impassible. The quake had a relatively shallow epicenter, at a depth of 10 kilometers (about 6 miles). Residents look for survivors in the rubble of a collapsed house after a 6.1-magnitude earthquake hit the area in Ludian county in Zhaotong, southwest China's Yunnan province Sunday. The quake hit at a relatively shallow depth of about 6 miles. Xinhua reports speaking to a resident of Ludian who says "it felt like 'sailing a boat' when he was driving a car in the tremor." Another resident tells the agency the streets now look like they've been through a war. A neighbor's two-story house fell down, she said. "It's so terrible. The aftermath is much much worse than what happened after the quake two years ago," the resident, Ma Liya, said. "I have never felt so strong tremors before. What I can see are all ruins." According to the U.S. Geological Survey, the quake hit in an area that's a bit more than 300 miles south of Chengdu, where powerful and deadly quakes struck in 2008 and 2013. "Overall, the population in this region resides in structures that are highly vulnerable to earthquake shaking, though some resistant structures exist. The predominant vulnerable building types are unreinforced brick masonry and ductile reinforced concrete frame construction." The quake's magnitude is being reported as 6.5 by Chinese officials, and 6.1 by the USGS.